I backed the quilt with Les Amis Ripples in Aqua Flannel purchased at Hawthorne Threads. I love the binding with the small grey lines (fabric: Just for fun, tiny stripes, from Marisa and Creative Thursday which can be found at Rock Paper Scissors NJ), from a distance it looks like a light grey solid. I have machine bound smaller items like pot holders and coffee cup sleeves but never a quilt. Why not give it a try. It turned out well. Lastly, like I mentioned above, I free-motion quilted loops. I think it turned out pretty well. I am happy that I changed from meander to loops. For some reason meander designs always reminds me of either coral or alien fingers :-). I loved the denseness of the quilting as it leaves lots of texture. 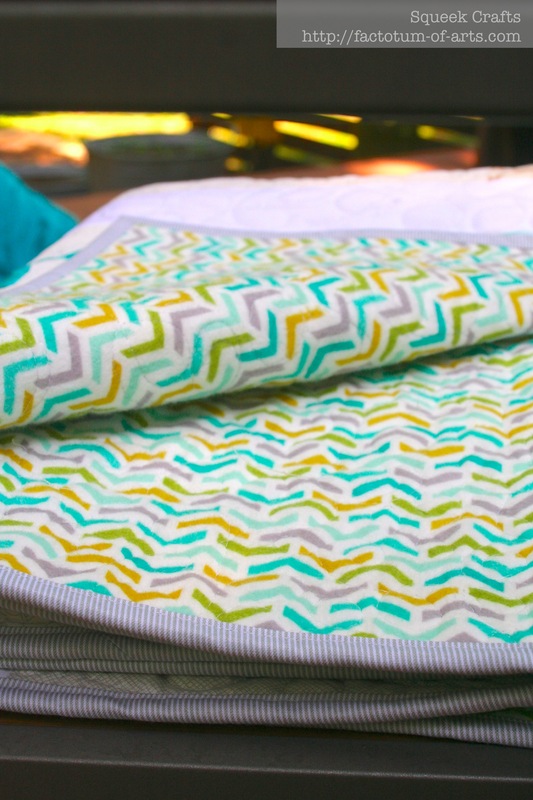 I loved using my Aurifil Light grey thread – it quilts so nicely. So, one last photo of the two big butterflies as I think they are fantastic and a highlight for me. Linking up with ALOYF (see button on the right) as this was my May goal…and I made it (for once :-D…big smile) and Sew Cute Tuesday (see button on right also). This entry was posted in Uncategorized and tagged Kaleidoscope, Kaleidoscope of Butterflies, Low-volume fabrics, paper piecing, patchwork, quilting on May 31, 2014 by mlwilkie. Beautiful finish! And hurray for finishing it in only a month! Very, very pretty, a perfect combination of vivid butterflies and a quiet background. Congratulations on the quilting, which has turned out really well. Beautiful quilt. The Butterflies pop so wonderfully on that low volume background. Love it! It’s lovely Michelle. I really like the loops -perfect for a butterfly. This is a very beautiful quilt! I love the simplicity of the design and the complexity of the butterflies! I also love to use flannel backings, especially for children. I will need to look into those paper pieced butterflies for sure. Thank you for sharing. Bravo on quilting it yourself! I am trying to work up my courage. 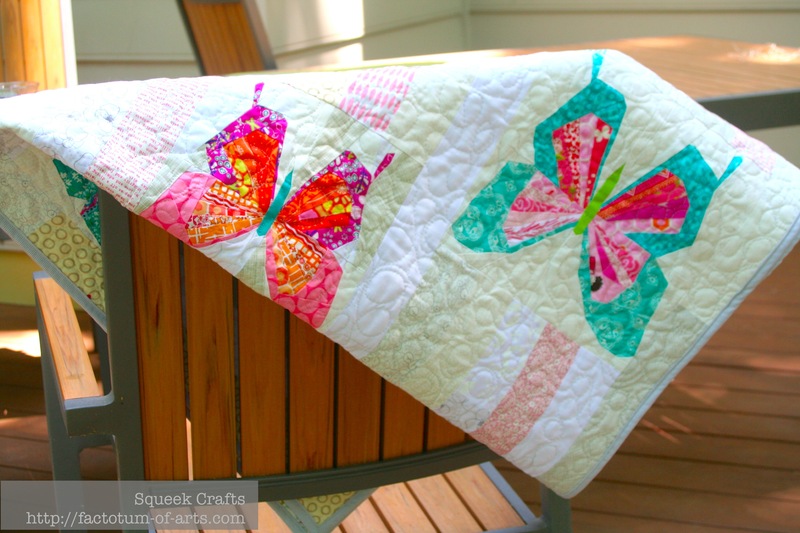 I love how the loopy quilting coordinates with the butterfly theme – their flight is always so free and loosely formed in loops just like your quilting! Congratulations on the wonderful finish! This came out beautiful! I love those butterflies!!!! Your quilting looks awesome. It’s awesome, it looks fantastic. Meandering reminds me of monster munch chips, i think of them while I’m meandering. The butterflies are showcased beautifully. Congratulations on all the firsts! It’s a quilt to be proud of. OBSESSED does not even begin to cover it. I love this quilt. The scrappy background, the binding, the amazing butterflies. The colors you chose are PERFECT! You did such a great job on this quilt, Michelle! I’m so proud of this one for you!!!! Wow that’s a lot of firsts! Looks amazing, the fabrics work beautifully together. 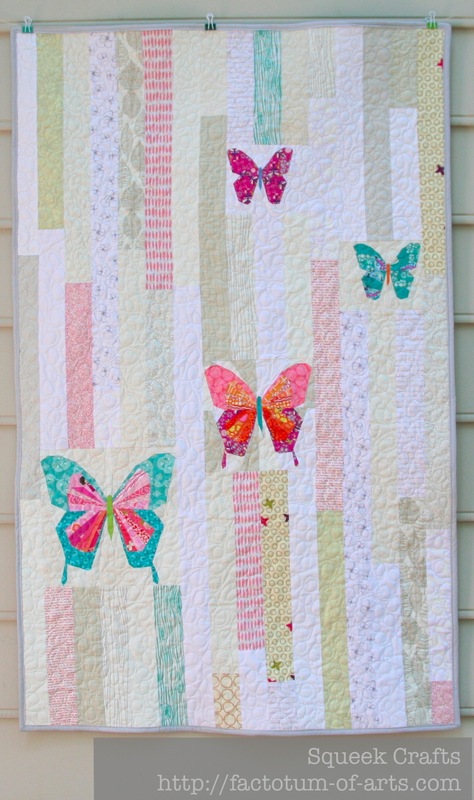 I think the loops mimic butterfly flight and were a perfect choice for the quilting. It is an excellent finish – congrats! Oh, this is such a beautiful quilt! 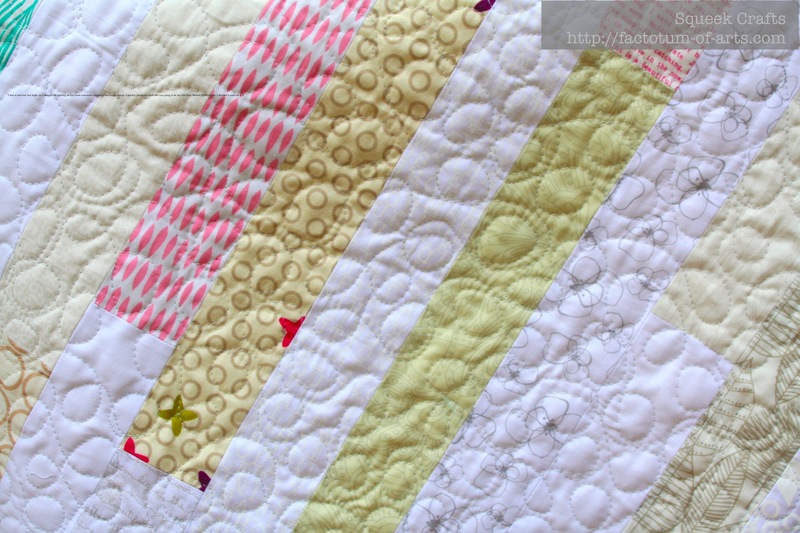 Love the loopy quilting, too! Thanks for the info about how to do the paper pieced butterflies. Might have to add this idea to the big brainstorm list…it’s just so, so pretty!